Chase Field boasts about having the best fan experience in the country. I have not been to all of the parks yet, but the folks that I met here are making a strong case to be at the top of my list. All of the parks have similar attractions (batting cages, face painting, halls of fame etc. 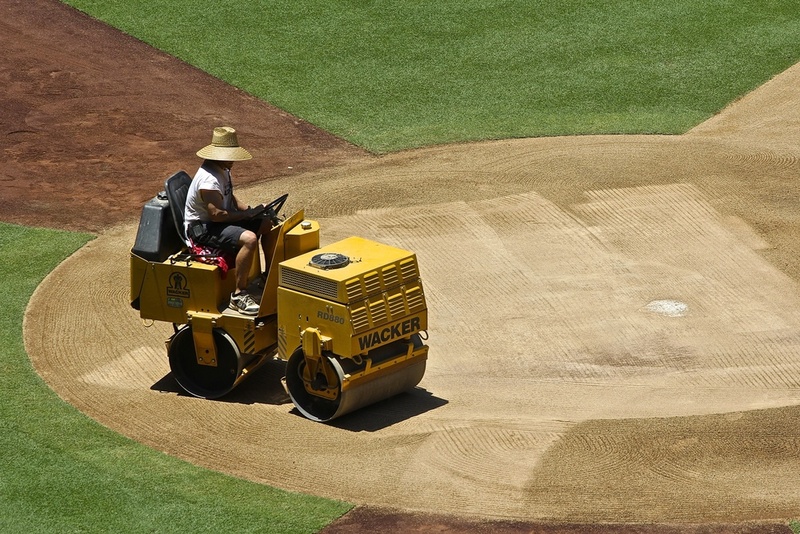 ), but ultimately it is the little things that set Chase Field apart. The first thing that stood out to me during yesterday's game and again today was the fact that their mascot D. Baxter was constantly interacting with fans in the stands. This playful bobcat wandered through the stands, messing around with unsuspecting fans and giving high fives to excited kids. It may not seem like a big deal, but in the moment it makes a big difference. In most stadiums I have been to, the team mascots have stayed around the field and the dugout. They come out in between innings for t-shirt cannon duties, but then retreat to the other side of the fence. There are some parks that have autograph signings where kids can stand in line to meet the mascots, but here in Arizona D. Baxter was running around the park signing things for kids and adults alike. Thanks for the sign Rally-backs! In addition to their mascot, what really impressed me were the Arizona Rally-backs. Once again, nearly every stadium has young men and women who pump up the crowd in between innings, but here in Arizona they take it one step further. For both games that I attended, the Rally-backs had a sign making station set-up on the main concourse. This allowed for both kids and adults to make their own signs with the help of some very talented artists. I met an incredible girl named Casey who helped me create my signs for the game pictured left. I ended up chatting with these women for almost 20 minutes about my tour and Arizona Diamondbacks baseball. It is the little things that make this park so special. Before the game my buddy Rindler and I took the Chase Field tour. We were joined by my sister's friend Andy who lives in the area. Andy is a former college baseball player so I had fun picking his brain as we explored the park. For the most part, this tour was similar to the ones given at other stadiums. We saw the press boxes, luxury boxes and sat in the dugout. Upon entering the bowels of the stadium however I caught a glimpse of the Diamondbacks legends costumes in storage. There is nothing creepier than the cold and lifeless eyes of Mark Grace staring at you from a storage closet. My favorite part of the tour was being able to see the field with the roof open and the sun beating down on the field. During the day the roof is kept open to let the grass soak up some much needed rays. 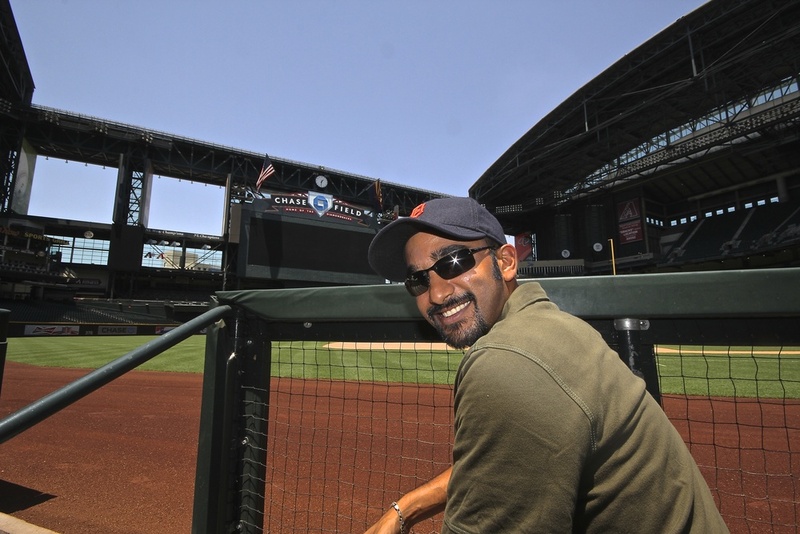 During the summer months (read: baseball season) the roof is primarily kept closed as the weather here in Phoenix constantly tops 100 degrees. Last night I was able to see the roof open after the game for the fireworks show, but seeing the field lit by the sunlight made me appreciate this park even more. After the tour, Andy took Rindler and I to a restaurant called the Tilted Kilt which is essentially Hooters with skirts. We did not really enjoy the sights at this fine dining establishment however because Andy and I got into a rather intense discussion about sabremetrics and what its place in the game is. During my brief hiatus from the game of baseball, sabremetrics transformed into a movement I was not fully prepared for. I read Moneyball back in 2003 and I casually knew who Bill James was, but in the last couple of years the sabremetric community has become a very large and vocal component of Major League Baseball. I am not saying anything new with that statement; however because I missed the popular rise of sabremetrics I feel like an old man arguing that baseball stats were better in the good ol' days before WAR and UZR and LMNOP (one of those is made up). Andy and I ignored the scantily clad waitresses delivering us our food in favor of arguing sabremetrics and its place in the game. The one thing that we agreed on is that while there are positives and negatives to sabremetrics, there is a definite breakdown in the communication between “old school” and “new school” baseball thinkers. We all want to have more accurate information and more importantly enjoy the game on the field. The problems arise when one side of the argument dismisses the other side as being irrelevant. Sabremetrics is a work in progress and I am sure that In 20-30 years we will have a system that is not only more advanced, but also understandable to the average fan (like myself). But enough about our nerdy conversations in a sports bar. If anything that is the saddest part of this sabremetrics debate – we were sitting in a sports bar arguing math. Andy had to leave us after lunch and go to a work function so Rindler and I headed over to the stadium. As there was no promotion for tonight's game there were far fewer people waiting in line. Once we got inside we made our way to the Diamond Club that had a large inviting sign reading “Open to All Fans”. On this level there was a bar and a seating area, however what caught my attention was a billiards table just begging to be played. Rindler and I played one quick game - in which I beat him handily, thank you very much - before going to get our signs made. To be fair I grew up with a pool table in my basement and spent many a lonely night watching the Tigers on TV and racking the table alone. I finally saw the Rockies score a run! This is my third consecutive Rockies game (one in Colorado and two here in Arizona) and it took them 25 innings to cross home plate for me. Sadly for them, the Diamondbacks put up 11 on the scoreboard for a pretty decisive victory. To continue with the tradition of being such a fan friendly club, several of the Diamondbacks stopped to sign autographs for the kids before the game. I have complained about indoor baseball since my game in Tampa and then subsequently in Miami and Houston, but here in Phoenix they do a great job of giving the fans a phenomenal time. The reason that I complained about indoor baseball in those other cities is that I felt the use of the roof was for convenience and comfort rather than extreme weather. With the temperature consistently remaining in the triple digits it in completely understandable why the roof must be closed and the air conditioning must be on. It is the difference between being uncomfortable and being unsafe. I got the feeling that the staff here at Chase Field would prefer to keep the roof open, but the realities of the desert lifestyle prevent them from doing so. In Houston they took pride in being indoors which is something that I was not a fan of. The D is a snake! Since we had eaten a late lunch my ritual of eating before the game was off for today. Instead Rindler and I opted to try out the three different priced hot dogs the Diamondbacks had to offer during the game. I realized while eating that it took me fourteen games to actually go buy and enjoy a hot dog during a game! I have been so focused on trying something special at each park, that I forgot to just sit back and enjoy the game with a dog. There were three versions of the ballpark frank that I decided to take part in. The "value" dog, the normal dog and the Diamondback dog. You may now insert your own Goldilocks joke here. After watching the young Tyler Skaags carve up the Rockies lineup in game 1 of this series it was time to take in Wade Miley do the same today. Miley one-upped Skaags by driving in three runs to help his own cause in the bottom of the second. With the bases loaded Miley found the gap in left field to clear the bases. 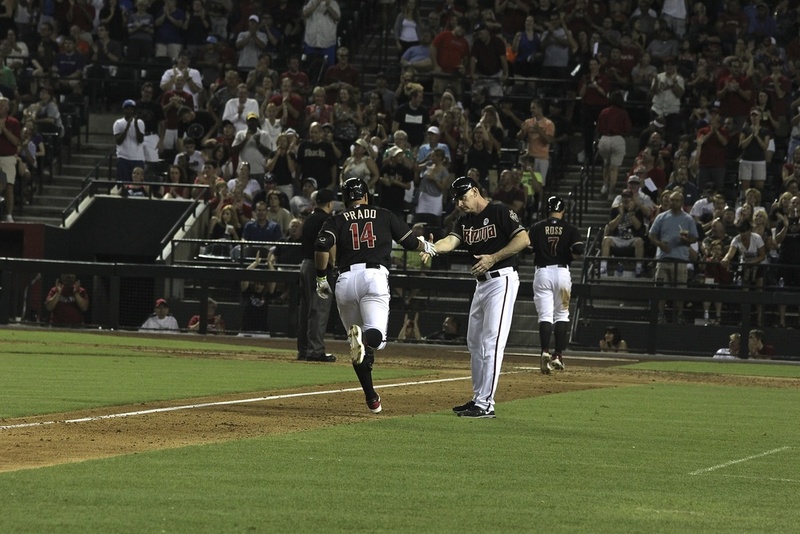 Paul Goldschmidt went deep after being announced as the Diamondbacks sole representative at this year's All-Star Game. I am proud to say that I voted for Goldschmidt on every ballot that I filled out this season. I chatted with Daniel McLaughlin and his daughter about what the Dbacks have meant to the city of Phoenix since coming here in 1998. Subscribe to the podcast to hear my chat with this amazing father and daughter duo. With another game in the books my short stay in Phoenix is over. Tomorrow Rindler and I head to San Diego where we will continue to follow the Rockies road trip as they take on the San Diego Padres. 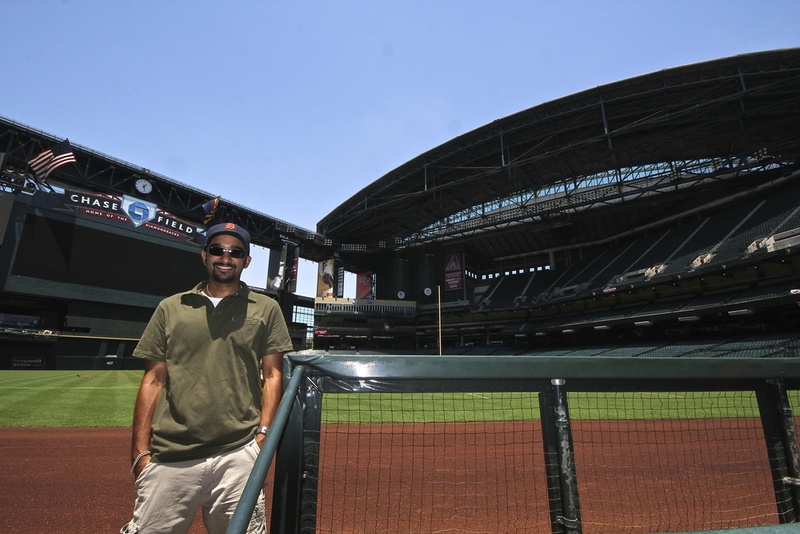 I am honestly blown away at the amount of fun I had here at Chase Field. For those of you who have had to suffer through my annoying anti-roof rambling I will fully admit that being indoors honestly did not affect my enjoyment of the ballgames here in Phoenix. The people that I met here were incredible and the staff at the park could not have been more accommodating. A lot of teams claim to give their fans the “best” experience in baseball, but this is the first ballpark thus far where I actually believe it. The bar has now been raised for the rest of this tour.